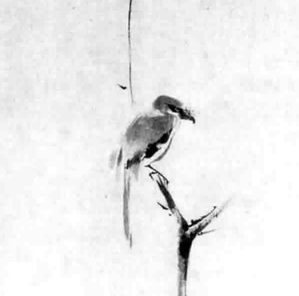 A common metaphor for calmness used in Aikido is that of the calm still surface of the lake which reflects alike the moon and the flying bird… This state of calm reflection is brilliantly portrayed in Miyamoto Musashi’s painting of a lone bird’s shriek on a withered branch. The eye of the bird, no more than a jot of ink, reflects that same mind which could reduce a dozen opponents to a single state of awareness. or click here to view the original HTML article. Republished here with thanks to AikiWeb and North Virginia Ki AIkido.